Graded VG-EX 4 by PSA. Very attractive example of key Hall of Famer Cy Young in a batting pose from the very popular E93 Standard Caramel series. This card features Cy Young at the tail end of his great career. It is fascinating to note that while his team is listed as "Cleveland, Amer." on this card, Young is clearly pictured in a Boston Americans uniform (his jersey has the Boston Americans' "B A" logo across the chest). This 30-card set was issued in 1910 by the Standard Caramel Co. of Lancaster, Pennsylvania. Bright and crisp, both front and back, with a bold yellow background, light wear to the corners, light toning to the borders, near-perfect centering, and flawless registration. The checklist reverse is clean with bold text. 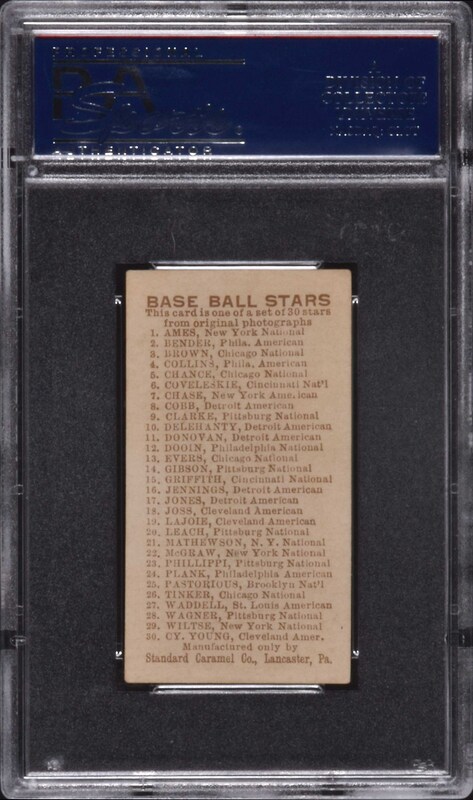 In our opinion, this card would not look out of place in a PSA EX 5 holder. 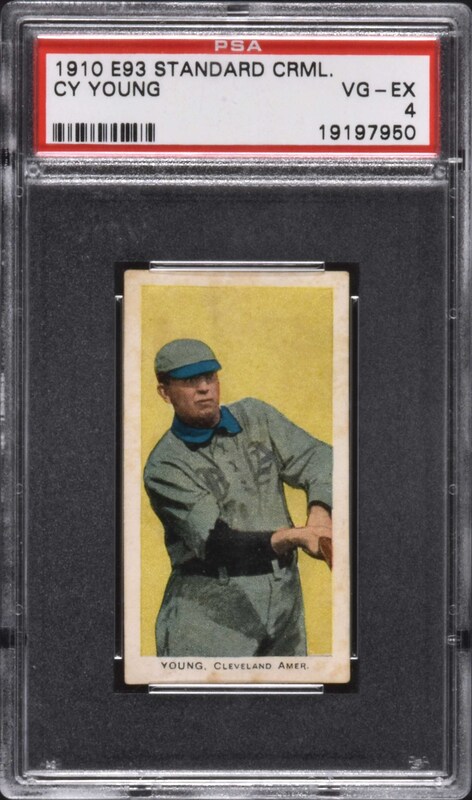 This is a very attractive example of one of Cy Young's most interesting and popular cards, and one of the key Hall of Famers from this rare, early twentieth-century candy issue. Reserve $400. Estimate $1,000+.